All Spring Valley homes currently listed for sale in Spring Valley as of 04/26/2019 are shown below. You can change the search criteria at any time by pressing the 'Change Search' button below. "Picture perfect single level home with incredible outdoor entertaining area featuring vanishing edge pool, spa with waterfall and detached outdoor kitchen with wine cooler, built-in Barbecue and Kegerator. Great room with vaulted beam ceilings, tile flooring, double sided fireplace, family room with bar & fabulous kitchen. Gorgeous custom cabinetry throughout home. Three spacious bedrooms including MBR suite w/walk-in closet. Indoor laundry room. See Supplement for additional features. Neighborhoods: South Mt Helix Equipment: Garage Door Opener,Pool/Spa/Equipment Other Fees: 0 Sewer: Sewer Connected, Public Sewer Topography: GSL"
"Single Level, New Build Homes by New Pointe Communities. Move In Ready. Enclave of 9 homes set on New Cul De Sac. 4 Bedrooms/ 2.5 Baths, Nice size backyards, Upgraded Kitchen Appliances built by Kitchen Aid, White Shaker Cabinets, Quartz Counters through out. 2.6 kw Sunpower solar system included, Great Room with Fireplace, Indoor Laundry Room, Mud Room, Built to latest energy efficiency standards. Located with easy access to freeway. Neighborhoods: Casa De Oro/Mt Helix Equipment: Garage Door Opener Other Fees: 0 Sewer: Sewer Available Topography: LL"
"New Build Homes by New Pointe Communities. Move In Ready. Enclave of 9 homes set on New Cul De Sac. Plan 3B with 5 Bedrooms/ 4 Baths, Pool size yard with room for granny flat, Upgraded Kitchen Appliances built by Kitchen Aid, White Shaker Cabinets, Quartz Counters through out. 2.6 kw Sunpower solar system included. Bedroom/Bath Downstairs, Great Room with Fireplace. 3 car tandem garage. Built to latest energy efficiency standards. Located with easy access to freeway. No Mello Roos. Neighborhoods: Casa de Oro Equipment: Range/Oven Other Fees: 0 Sewer: Sewer Connected Topography: LL"
"New Build Homes by New Pointe Communities. Move In Ready. Enclave of 9 homes set on New Cul De Sac. Plan 2B with 4+1 optional Bedrooms, 3 Baths, Nice size backyard, Upgraded Kitchen Appliances built by Kitchen Aid, White Shaker Cabinets, Quartz Counters through out. 2.6 kw Sunpower solar system included. Bedroom/Bath Downstairs, Great Room with Fireplace. 3 car tandem garage. Built to latest energy efficiency standards. Located with easy access to freeway. No Mello Roos. Low HOA. Neighborhoods: Casa de Oro Equipment: Range/Oven Other Fees: 0 Sewer: Sewer Connected Topography: LL"
"New Build Homes by New Pointe Communities. Move In Ready. Enclave of 9 homes set on New Cul De Sac. Plan 3A with 5 Bedrooms/ 4 Baths, Pool size yard with room for granny flat, Upgraded Kitchen Appliances built by Kitchen Aid, White Shaker Cabinets, Quartz Counters through out. 2.6 kw Sunpower solar system included. Bedroom/Bath Downstairs, Great Room with Fireplace. 3 car tandem garage. Built to latest energy efficiency standards. Located with easy access to freeway. No Mello Roos. Neighborhoods: Casa de Oro Equipment: Range/Oven Other Fees: 0 Sewer: Sewer Connected Topography: LL"
"New Build Homes by New Pointe Communities. Move In Ready. Enclave of 9 homes set on New Cul De Sac. Plan 2A with 4 +1 optional Bedrooms, 3 Baths, Nice size backyards, Upgraded Kitchen Appliances built by Kitchen Aid, White Shaker Cabinets, Quartz Counters through out. 2.6 kw Sunpower solar system included. Bedroom/Bath Downstairs, Great Room with Fireplace. 3 car tandem garage. Built to latest energy efficiency standards. Easy access to freeway. No Mello Roos. Low HOA. Neighborhoods: Casa de Oro Equipment: Range/Oven Other Fees: 0 Sewer: Sewer Connected Topography: LL"
"New Build Homes by New Pointe Communities. Move In Ready. Enclave of 9 homes set on New Cul De Sac. Plan 3A with 5 Bedrooms/ 4 Baths, Nice size backyards, Upgraded Kitchen Appliances built by Kitchen Aid, White Shaker Cabinets, Quartz Counters through out. 2.6 kw Sunpower solar system included. Bedroom/Bath Downstairs, Great Room with Fireplace. 3 car tandem garage. Built to latest energy efficiency standards, Make your reservation early! Located with easy access to freeway, No Mello Roos, Low HOA. Neighborhoods: Casa de Oro Equipment: Range/Oven Other Fees: 0 Sewer: Sewer Connected Topography: LL"
"New Build Homes by New Pointe Communities. Move In Ready. Enclave of 9 homes set on New Cul De Sac. Plan 3A with 5 Bedrooms/ 4 Baths, Nice size backyards, Upgraded Kitchen Appliances built by Kitchen Aid, White Shaker Cabinets, Quartz Counters through out. 2.6 kw Sunpower solar system included. Bedroom/Bath Downstairs, Great Room with Fireplace. 3 car tandem garage. Built to latest energy efficiency standards, Make your reservation early! Located with easy access to freeway. No Mello Roos, Low HOA. Neighborhoods: Casa de Oro Equipment: Range/Oven Other Fees: 0 Sewer: Sewer Connected Topography: LL"
"New college prep middle school completed soon nearby. This home has 6 bedrooms, 3.5 baths and 3354 sq. ft. of living space. Four bedrooms with French doors open to balcony for cool evening breezes and stunning sunsets. The landscaped and terraced front yard features sweeping local mountain views. Covered patio provides a private oasis for BBQ's. Designer touches throughout. .49 ac. NO HOA! 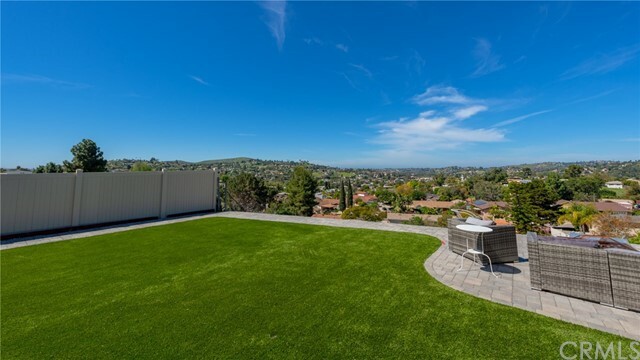 Neighborhoods: Mount Helix Equipment: Garage Door Opener, Range/Oven Other Fees: 0 Sewer: Public Sewer Topography: GSL"
"Tastefully remodeled Mt Helix home with stunning views! This home is beautifully designed w/vaulted wood beam ceilings, opening up the already bright & spacious home, elegant curved archways adding tons of charm, decorative Spanish tile fireplace, plus all new; flooring, paint, counter-tops, cabinets. Great layout w/3 bedrooms & main living area upstairs, plus large family room & extra bedroom downstairs, perfect for extended family or roommate situation. Enjoy the large viewing deck for outdoor eating! Neighborhoods: Casa De Oro Other Fees: 0 Sewer: Sewer Connected Topography: RSLP"
"Oversized corner lot located in the Highlands Ranch neighborhood of Spring Valley. This home on the Cul-de-sac features a 3 car garage, over 2900 square feet of living space, and 4 spacious bedrooms. Out back is an entertainer's dream with a private pool and spa, perfect for hosting BBQ's during the summers in California. ONE OF THE VERY FEW HOMES IN THE NEIGHBORHOOD TO HAVE A POOL & LARGE LOT. Add this gem to your must see list today! Neighborhoods: Pointe Parkway Equipment: Dryer,Pool/Spa/Equipment Other Fees: 0 Sewer: Sewer Connected Topography: LL,"
"BEAUTIFUL CUSTOM HOME ON 2 BUILD-ABLE LOTS THE MOST UPGRADED HOME YOU WILL SEE TODAY 3 BEDROOM 2 BATH MAIN HOUSE AND 1 BEDROOM 1 BATH GUEST APARTMENT FENCED AND ELECTRONICALLY GATED ENTRY STUNNING LAKE AND MOUNTAIN VIEWS 3 VIEW BALCONIES HUGE CONCRETE AND PAVED DRIVEWAY ROOM TO PARK 10 CARS AND RV PARKING ALL INSIDE THE GATES KITCHEN BOASTS GRANITE COUNTER TOPS HIGH END STAINLESS APPLIANCES HARDWOOD FLOORS CUSTOM BATHS ENERGY EFFICIENT WINDOWS AND DOORS FINISHED GARAGE AND WORK SHOP SPA TONS FRUIT TREES Neighborhoods: THE POINT Equipment: Dryer,Garage Door Opener,Pool/Spa/Equipment, Range/Oven, Washer, Water Filtration Other Fees: 0 Sewer: Sewer Connected, Public Sewer Topography: LL,RSLP"
"Remodeled from Top to Bottom Beautiful Move in ready 4 Bed, 3 Bath, 2 Car garage Home on a Cul-De-Sac. The gourmet Kitchen will not disappoint the Chef at Heart. Beautiful custom cabinetry, granite counter tops throughout, walking pantry, convenient pot filler, stainless steel appliances, updated bathrooms, laminate flooring throughout. Beautiful landscape surrounds the property with built in bbq for family gatherings, extra parking space for RV, boat or toys, Bonus room not included in Sq ft. Neighborhoods: Goodman Acres Other Fees: 0 Sewer: Sewer Available Topography: LL"
"VIEWS like this sell for a million dollars plus! All major living areas enjoy expansive views to the south and west. This 3980 sqft home hits all the buyer buttons. Large living room with slider door to a wrap around deck made with Red Balau. Designated large dining area and a kitchen any cook would love with gas range, large island and eat at bar. 3 very large bedrooms up w/ a master suite down. 2 car and 1 car garage (she shed, workshop) College Prep Middle, rated 9 out of 10 is w/in walking distance! Neighborhoods: Casa de Oro Equipment: Garage Door Opener, Range/Oven, Satellite Dish, Shed(s), Water Filtration Other Fees: 0 Sewer: Sewer Connected Topography: LL,GSL"
"Welcome home to the Pointe! Lakeview Estate Community. Panoramic Views Coronado to Sweetwater Lake and the Mountains. Open floor plan with elegant tile flooring throughout. 1 Bedroom and Bath on the ground floor 4Br upstairs, Large Gourmet Kitchen with maple cabinetry & Island. Open to the family room, creating an expansive living space. Fireplace in family room, The large master bedroom offers dual walk-in closets and a spacious master bathroom. Stamped concrete around the home, Built--in BBQ Large lot. Neighborhoods: Lakeview at Highlands Ranch Equipment: Dryer,Garage Door Opener, Range/Oven, Washer Other Fees: 0 Sewer: Sewer Connected Topography: LL,GSL"
"Gorgeous Spacious home with Sweeping views. Designer upgrades located in a quiet gated Rancho San Diego community. Open floor plan perfect for entertaining. custom window treatments, Chefs kitchen with Maple cabinetry. Shows like a Model. Spacious Master suite with his and her Walk in closets. granite counter tops with Dual sinks. Enjoy views from the Spa tub. Freshly painted inside and out. Modern grey and White. Reverse osmosis water softener. Too much to mention! YOUR CLIENTS WILL LOVE THIS PLACE! Neighborhoods: Spring Valley Equipment: Garage Door Opener Other Fees: 0 Sewer: Sewer Connected"
"Turn key! Park like setting- Large grass yard, mature fruit trees, room for gardening or chickens! This home is located on a very quiet and cute cul de sac! 3rd car garage has been converted to a man cave (or additional storage space) including a separate room for a potential art/drawing studio. Kitchen has been upgraded with granite and stainless appliances. RV parking and paid off solar! Beautiful flooring with lots of natural light. A true gem. Neighborhoods: Spring Valley Equipment: Dryer,Garage Door Opener, Shed(s), Washer Other Fees: 0 Sewer: Sewer Connected Topography: LL"
"Nestled on a large corner lot with a striking view. This renovated home boasts luxury with a completely new look inside and outside. Updated electric, plumbing, HVAC, windows and roof. Inside the home there are 3 bedrooms and 2 spacious bathrooms. The house is complete with new lighting, as well as vaulted ceilings in both the living and dining room. The master bedroom has a walk-in closet. The house also includes 2 Parcels which gives plenty of space for parking an RV as well as multiple cars. Neighborhoods: Casa De Oro Equipment: Dryer Other Fees: 0 Sewer: Public Sewer Topography: SSLP"
"Single story 4 bedroom 2 bathroom home with side yard RV parking, plus two car garage up in the highly desirable area of Mt Helix/Casa De Oro, Spring Valley. This home features an entertainment room with vaulted ceilings, a slate fireplace and mantle, a built-in entertainment center and a wet bar. Step outside and enjoy the amazing backyard views towards the ocean. The backyard features a sunny, low maintenance paved patio with turf and vinyl fencing. For some shade, move over to the covered patio with spa hook-ups, for a great private view in the evenings. Just beyond the upper yard, is a staircase leading down slope to the fenced lower yard, previously used for chickens. Inside, the kitchen includes dishwasher and stainless steel refrigerator, and leads to a second smaller dining room with a ceiling fan and window overlooking the front yard. The bedrooms are carpeted, Master bedroom includes ceiling fan and the Master bath features his / her's sinks. This is an entertainer's dream, with plenty of space to host and connect with loved ones!" "Welcome home to this comfortable six bedrooms ONE STORY ranch style house, located on the large lot. New owners will love PRIVACY and panoramic views. Full of elegance and practical living, this home offers open floor plan with formal living room, spacious kitchen, opening to a family room with a fireplace to enjoy winter nights and comfortable bedrooms. SOLAR and A/C are great features! Please arrange your private tour today to see this fantastic home with tons of custom touches! Neighborhoods: Spring Valley Equipment: Dryer, Washer Other Fees: 0 Sewer: Septic Installed"
"VRP $619,000 - $639,000. SINGLE STORY - BRAND NEW CUSTOM - RARE FIND! 4 Bedrooms 2 Full Baths. Still Time To Select Your Upgrades! Above it all w/ wonderful views to downtown. Light open airy floor plan with high ceilings lots of natural light! Kitchen features designer granite countertops, wood cabinetry and stainless steel appliances. Designer features throughout. Walk in closet in master. Bathrooms granite tops and wood vanities. NO HOA & NO Mello Roos! Sqft & measurements are estimates. See Supp Neighborhoods: Spring Valley Architectural Style: Custom Built View: Custom Built Equipment: Fire Sprinklers,Garage Door Opener Other Fees: 0 Sewer: Sewer Connected, Public Sewer Topography: ,RSLP"
"Seller Will Entertain Offers Between $630,000 and $675,000 - This Is A Beautiful Remodeled Home - Vaulted Ceilings - New Paint - Laminate Floors Throughout - Granite Counter Tops - 4 Bedroom 2 Bath House - Central Heat and Central Air - Magnificent Views - Large Fenced Backyard - 2 Macadamia Nut Trees - 3 Avocado - 1 Lemon - Separate Guest Quarters With Living Room, Bedroom and Its Own Full Bath Separate Entrance Perfect for AirBnB This House is a Must See Neighborhoods: La Mesa County Club Equipment: Garage Door Opener Other Fees: 0 Sewer: Sewer Connected Topography: ,,GSL Guest House Est. SQFT: 173"
"Why waste $300 or more monthly on RV parking? This property has room for RV's, Boats & more. Looking to work on your project cars from home? Not a problem. This house has a fenced-in drive way with 6 ft gate. The RV parking has power, sewer & water connections. Huge family room with fire place prefect for Thanksgiving & Christmas dinner. Home has been renovated from top to bottom with elegant finishes. Basically, this Home could be your forever home. Neighborhoods: Casa de Oro Equipment: Garage Door Opener Other Fees: 0 Sewer: Sewer Connected Topography: LL"
"Gorgeous, custom built home with a view in the Casa De Oro neighborhood in close proximity to Mt. Helix. This 4 bedroom 3 bath split level view home was built in 2010 with almost 2000 sqft. Situated on a hill, this home boasts a great floorplan with an open kitchen and plenty of natural light, and a fireplace in the family room. Upgraded stainless appliances and granite counters, laundry room and patio area are a few other features of the beautiful home. Neighborhoods: Casa De Oro Equipment: Garage Door Opener, Range/Oven Other Fees: 0 Sewer: Sewer Connected"